Professor of Architecture History Marta Gutman (top) has brought her research into creation of charitable landscapes for children into the classroom. 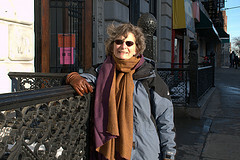 She is seen outside the Hamilton Grange Public Library, one of the locations documented in a workshop she conducted on children-friendly sites in Hamilton Heights. Her dissertation, which will be published as a book, describes how the women of Oakland, Calif. created a charitable landscape in that city. New York is experiencing a new baby boom. Between 2000 and 2007, the number of children under age five just in Manhattan grew by 32 percent, according to The New York Times. In this densely populated city, with its costly real estate, finding space for kids to be kids can prove daunting. Rather than only build brand-new facilities, however, children’s advocates should consider repurposing and adding small-scale projects to New York City neighborhoods that can attract additional investment, contends Dr. Marta Gutman. A licensed architect and professor of architecture history in the Bernard and Anne Spitzer School of Architecture at The City College of New York, she has made studying how child-friendly city neighborhoods get created a focus of her research. Her doctoral dissertation at University of California, Berkeley, examined how women in nearby Oakland repurposed houses, stores and even a saloon to create a “charitable landscape” full of places for immigrant and migrant children. The effort began with an orphanage, but quickly expanded to more homes for children, free kindergartens, settlement houses, day care centers and playgrounds. Currently on sabbatical, Professor Gutman is putting finishing touches on “What Kind of City: The Charitable Landscape Women Built for Children in Oakland, California,” the book manuscript developed from her doctoral research, which will be published by University of Chicago Press. She received funding from the National Endowment for the Humanities and the Center for Working Families at UC Berkeley (funded by the Alfred P. Sloane Foundation). She also co-edited with Ning de Coninck-Smith “Designing Modern Childhoods: History, Space, and the Material Culture of Children,” which was published in 2008 by Rutgers University Press. Professor Gutman studies the charitable landscape for children with students in the Spitzer School of Architecture, as well. In an experimental interdisciplinary seminar, graduate and undergraduate students worked together to document in Hamilton Heights adaptive reuse, purpose-made places and how kids appropriate urban places and reinvent them on their own terms. Using public history tools, students designed a website to present their research to the community - http://childrenandthecity.weebly.com/. Examples of the Oakland model can be found elsewhere in New York. “First imprints count, and so do public-private partnerships,” Professor Gutman says. East Harlem’s Thomas Jefferson Park, opened over a century ago, was built with a recreation pier, sports pavilion, track, children’s garden and bathhouse. 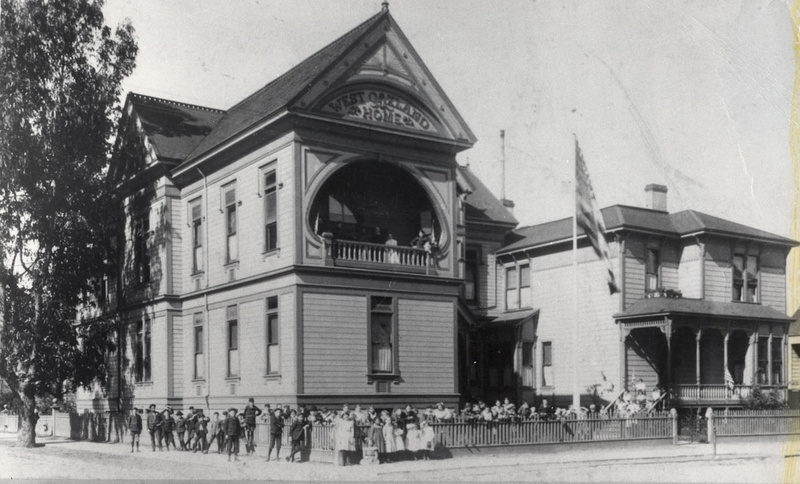 Soon after, a Boys’ Club and Benjamin Franklin High School opened nearby. During the New Deal era, master builder Robert Moses added additional bathhouses and a swimming pool, one of ten built in New York with WPA (Works Progress Administration) grants. In the 1960s, Local 1199 of the Service Employee International Union constructed affordable housing in the neighborhood. Today innovators continue to think about the city in terms of kids. Women collaborated to make possible Sugar Hill, a mixed-use building being constructed by Broadway Housing Communities at St. Nicholas Avenue and West 155th Street that will serve as home to the Faith Ringgold Children’s Museum of Art and Storytelling, a childcare center and 124 units of affordable housing. Brooklyn’s Williamsburg neighborhood, known of late as a magnet for twenty-something hipsters, now offers private preschools; indoor play spaces and art, movement and music classes. The Knitting Factory concert hall there, a hipster haven, hosts children’s shows on weekend mornings. The incremental, neighborhood approach is essential, Professor Gutman says. “It should be mixed with looking at children’s issues on a citywide basis, like Mr. Moses did when he built those swimming pools while serving as New York City’s commissioner of parks and recreation. The critical element, she says, is making the first improvement. Once it gets built, it becomes “powerful when linked by public space and multiple organizations. But, you need a focal point and you need a landscape first.” Small parks such as Jackie Robinson and Thomas Jefferson Parks in Harlem and Astoria Park in Queens can fill that role, she suggests.